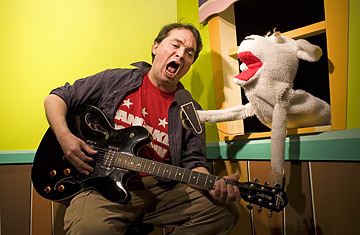 Creator Stuckey performs a song with Rufus Leaking, his puppet co-host. MUSIC MAN A talking sheep named Rufus Leaking, a hot band and a crowd of kids jumping around onstage are the key ingredients of Pancake Mountain, one of the most energetic--and certainly one of the hippest--kids' shows on the planet. The ingredients are basic, but it took Washington-based Scott Stuckey, 44, and a group of volunteers to make a hit out of them.